Temperature and humidity sensors can be invaluable data collection tools when deployed in your home, office, lab, manufacturing line, killer robots, etc. If your project requires multiple temperature/humidity sensors spread across multiple locations, there is a good chance you need something reliable, compact, accurate, and affordable. If you also want your sensors logging to a web-based dashboard and/or sending you SMS/email alerts, then this tutorial is for you. The setup for each sensor node is going to cost ~$31 plus shipping (~$37+shipping with the case). You can easily get each item above in bulk to minimize shipping costs with the exception of the Raspberry Pi Zero WH, which may be more challenging outside of the UK. As of the time of this writeup, it is hard to find a vendor that allows more than one Zero WH per order except for several UK vendors that have either no limit or a limit of 10. We are using the $14 Zero WH instead of the $10 Zero W for two reasons. 1) No one is allowed to sell more than one unit per order for Zero W per Raspberry Pi rules (boo!) and 2) The Zero WH has the header pre-soldered, which will make our project assembly super quick and easy. We are using the DHT22 temperature/humidity sensor because of its temperature accuracy (+/- 0.5 °C), humidity range (0–100%), and low cost. We also want something really easy to wire up without having to add a pull-up resistor or anything funky. You will need a monitor and keyboard to setup your Pi Zero WH the first time. Once it is setup, you won’t need either a monitor or a keyboard to run when deployed in your space. We want to keep each node as small and compact as possible. You need to install the standard Raspbian operating system so your Pi Zero WH will boot. You can follow the instructions at https://projects.raspberrypi.org/en/projects/raspberry-pi-setting-up to setup your Pi Zero WH. Connect your Pi Zero WH to your WiFi network https://projects.raspberrypi.org/en/projects/raspberry-pi-setting-up/6 . Register for an account at https://iot.app.initialstate.com . With our o/s installed along with our two Python modules for reading sensor data and sending data to our Initial State account, we are ready to write our Python script. The following script will create/append to an Initial State data bucket (a collection of data streams grouped together so you can view them in a dashboard), read DHT22 sensor data, and send that data to your real-time dashboard. All you need to do is modify lines 6–11. The value on line 6 should be unique for each node. This could be your sensor node’s room name, physical location, unique identifier, or whatever. Just make sure it is unique for each node to ensure that the data from this node goes to its own data stream in your dashboard. The name of the data bucket is specified on line 7. This can be changed at any time in the Initial State UI (more info). The bucket key on line 8 needs to be the same bucket key for every node you want displayed in the same dashboard (more info). Your Initial State account access key has to be specified on line 9. Copy+paste this key from your Initial State account (more info). The time between sensor reads is specified on line 10. Change accordingly. You can specify metric or imperial units on line 11. Repeat these steps for each sensor node. As long as each node is sending data to Initial State using the same access key and bucket key, all data will go into the same data bucket and show up on the same dashboard (more info). Once you have multiple nodes deployed, you are going to want a way to monitor each node to ensure it is functioning. You will probably run each sensor node without a monitor or keyboard/mouse to keep it compact. That means you will probably want each node to boot and run your script automatically. You can use your Initial State account to create a handy process/IP address dashboard as shown above. A detailed tutorial on creating this dashboard and setting up your Pi Zero WH to auto-run your Python script on boot can be found at https://github.com/initialstate/pi-process-dashboard/wiki . Once you get a single sensor node set up and running, it is easy and relatively inexpensive to duplicate your setup as many times as needed. Using a Pi Zero WH gives you the flexibility to run other tasks since it has so much horsepower. For example, you can use one of the Pi Zero WHs to pull local weather data from a weather API and add it to your sensor dashboard (tutorial at https://github.com/initialstate/darksky ). 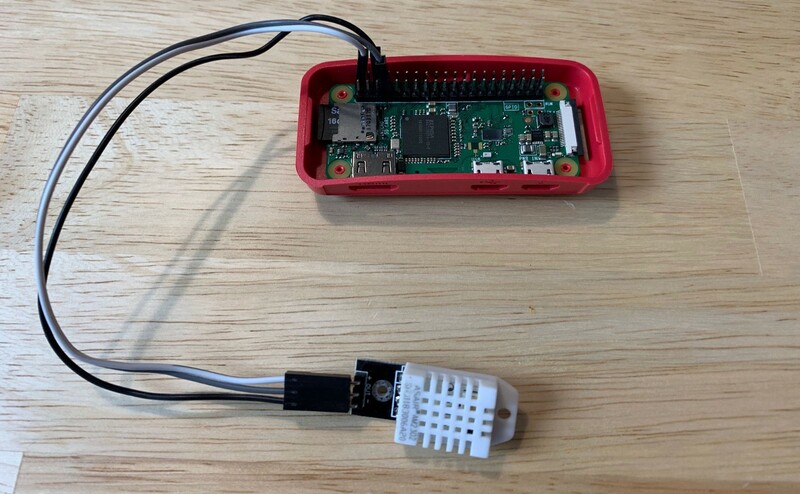 If you decide to decommission your sensor nodes, you can reuse your Pi Zero WHs for other projects. This flexibility helps future-proof your project investment.